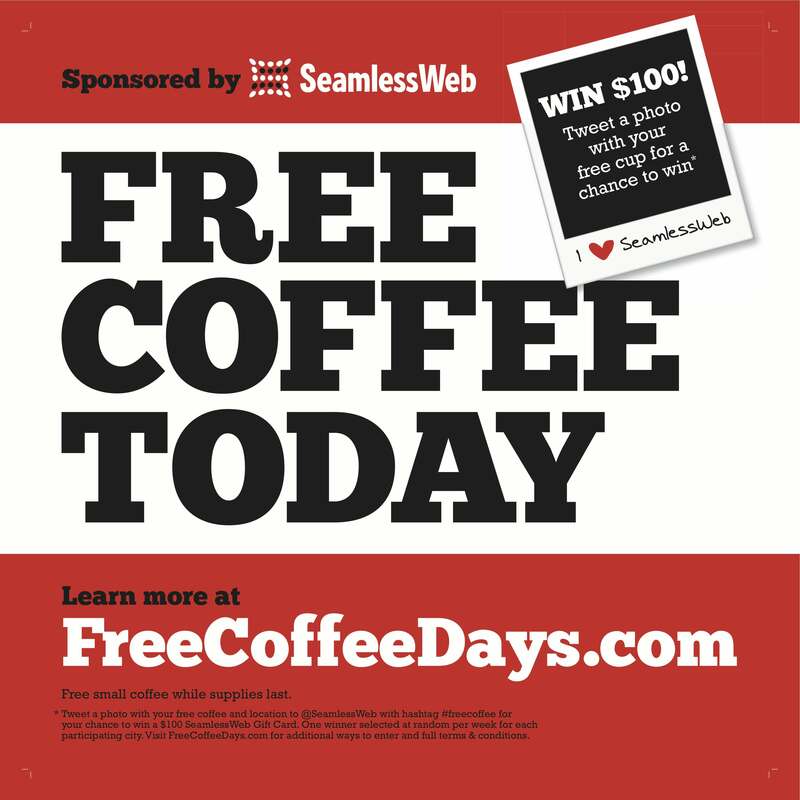 SeamlessWeb Wants to Get You Caffeinated and Give You Free Stuff – We Want to Help! For two years now, SeamlessWeb has been providing welcome jolts of caffeine to weary New Yorkers from time to time. Starting today, they’re doing it here in Washington too. And to celebrate, they want us to give you free cash. Go figure, we said yes. Let’s start with the free coffee. If you were in the vicinity of Foggy Bottom this morning, you may have noticed a bright red truck trumpeting SeamlessWeb’s online food delivery service. Hopefully you bothered to wander over to find out what it was all about. If you did, you were part of FreeCoffeeDay! If not, you missed out. But don’t worry – the truck is going to be making the rounds for the next three days, stopping at Union Station tomorrow, Dupont Circle on Wednesday and in Chinatown on Thursday. Each day, you’ll be able to stop by the truck and pick up a free cup of coffee to help get your day going. And to sweeten the deal just a little bit further, SeamlessWeb is running a Twitter promotion in conjunction with FreeCoffeeDay. Tweet a photo of yourself enjoying your free coffee to @seamlessweb and the hashtag #freecoffee and you’ll earn a chance at a free $100 SeamlessWeb gift card. The free coffee doesn’t stop flowing on Thursday. Starting next Monday, the 14th, and running through to the 27th, you’ll be able to swing by some of the local restaurants you can find on SeamlessWeb’s normal delivery service and score a free cup of coffee from them, as well. Play your cards right and you’ll be jittering your way through the entire month of February on someone else’s dime. So what about that free stuff they want us to give you? How do two $25 SeamlessWeb gift cards sound? They’re yours for the winning – all you have to do is tell us how you take your coffee, just like that sweet little girl did in the movie Airplane! The two answers that make us laugh the loudest will win. Not familiar with SeamlessWeb? Neither were we, but they’ve been offering online ordering and free delivery from all kinds of restaurants here in DC since 2003. I did a quick search, and they’ve got 30 restaurants that will deliver right to my office. I can choose from Indian, Japanese, pizza or Turkish, as well as a wide range of offerings via Takeout Taxi, all accessible through SeamlessWeb’s site. Use code FREECOFFEE on the site, and you can save an additional $5 on your first order of $10 or more.